The bronze statuary known as the Aviator has proudly stood watch over the Linsly campus since the early 1900's. It has served as the symbol of the ideals of Linsly's current and former students. The Aviator was created by internationally known sculptor Augustus Lukeman and commissioned by Sallie Maxwell Bennett as a memorial to her son, Lt. Louis Bennett Jr, who was killed in action August 24th, 1918, while serving as a lieutenant in the Royal Air Force in France. Bennett's record during August 15th - 24th was three enemy planes and balloons destroyed. 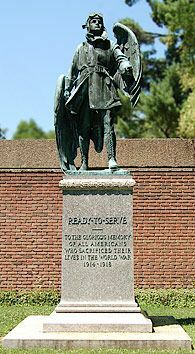 When Colonel Charles Lindbergh visited the Wheeling area in 1927, he made a special trip to the Linsly campus where he placed a wreath at the base of the sculpture in memory of all the World War I aviators. The words "Ready to serve…", found on the base of the monument's front, have reminded generations of Linsly men and women of those many who have served and sacrificed for their country. "And thus this man died, leaving his spirit as an example of able courage, not only unto young men, but unto all the nation."